We are a leading manufacturer, supplier and trader of the Lightweight AAC Blocks. Our offered products are Autoclaved Aerated Concrete Block, AAC Block, and Lightweight AAC Blocks. 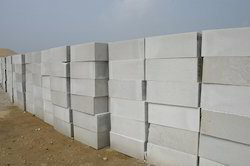 Backed by the assistance of our experienced professionals, we have been the prominent manufacturer and supplier of a qualitative range of Lightweight AAC Blocks. The provided block is manufactured by our adept professionals using the best quality autoclaved aerated concrete mixture and modern technology. Offered block is highly demanded by our precious clients owing to its sturdiness and durable finish. Furthermore, our clients can avail this block from us at most affordable price. Looking for “Lightweight AAC Blocks”?